Old school Dan Garrett as the Blue Beetle. Funny how, in this picture, his cowl looks less like chainmail, and more like he has blue brillo-pad hair. Just another day in the life of The Blue Stalker. Umm… where does his right arm go from the elbow up? Just wondering. Why is he wearing a mini skirt? Looks to be hooked in a small window to me. 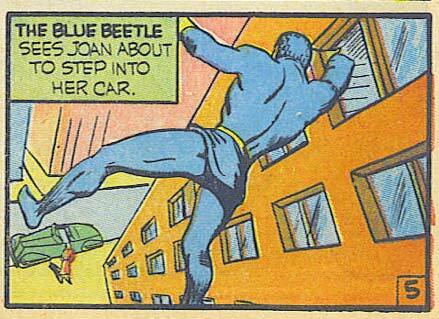 This is the original “Blue Beetle”, who wore a chainmail tunic (with the attached hoodie). So that’s not a skirt, just the bottom of the chainmail shirt. In this panel, he’s hanging onto the woman’s window by his crooked elbow. Also, he may be planning on poop-bombing her windshield, though I can’t prove that. ‘Hanging onto’ the window? It looks like he’s doing some sort of bizarre one-armed push-up off the windowsill. The perspective on that is truly wonky otherwise. The name of the comic is, ‘The Big Three’, he may not be planning to do a number 2 OR number 1, Jeff. Anyone else notice his right glove went ghost on us? It could be worse, it could of been the whizzer passing over but I dont think he would be climbing out a window like that though.